A nightly but generally inferior version of everyone's favourite toga wearing restricted card. There are much better icon spreads on other cards you can "ambush" into play, and a lot of those tend to be a bit cheaper too. Sacrifice generally is looking weaker than return to hand (cultist decks aside). Also as a neutral card I'd want a stronger pick because I don't like having to resource neutral cards, therefore don't put any into decks. Its not the first choice of night card I'd have. If you ambush in a character you want either combat or terror icons, not only arcane icons. 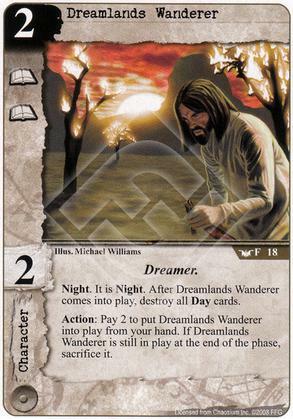 synergy with the dreamer subtype typically involves standing effects, something this character Doesn't benefit as much from due to having arcane icons. The only good thing about this card is surprise night which can be an unexpected shock for your opponent. If you really need a Night effect to trigger outside of your Operations phase, this is your guy. He's pretty awful for ambushing things otherwise, due to the lack of Willpower and/or Toughness. Also doesn't go back to your hand for later use. If you're playing him without the ambush, it's probably for the Night effect, and there are better options for that. Hugely valuable in my Ghoul Night deck that wants to make it Night ASAP. I want Untimely Burial going to work on turn 1, if possible, and this card enables that. It also brings some badly needed arcane to a bunch of Ghouls that desperately need it. In that build, at least, this guy is 5 stars.